How do AMP articles perform in the mobile SERP for Google News OneBoxes? In the race for the rankings in the mobile SERP (Search Engine Results Page) for Google News OneBoxes, AMP (Accelerated Mobile Pages) seem to gain more and more importance, especially in the News Carousel, sometimes aka AMP Carousel. We analysed with the Trisolute News Dashboard how many ranks are AMP indeed, and gathered the results in an info chart. The data for the news-related mobile SERP which is underlying the following figures is gathered from mid of May till the end of August 2016 for following countries: USA, UK, France and Germany. In order to understand the News Box in the mobile SERP, the single elements are crucial. There are carousels, text elements, and headlines. Carousels consist of various images, text elements of text only; and headlines combine an image with a text element. The elements are not appearing equally in the mobile News OneBox. In an analysis over four different countries we found Headlines in less than 1% of the mobile News Boxes. Text ranks are relatively strong in France (91%) as well as in Germany (85%). They appear a bit less in the USA (73%) and in the UK (78%) in the mobile News Boxes. Carousels already appear in the USA with 63% and in UK with 54% of the News Boxes. In Germany and France already 29% of the analysed News Boxes had a carousel. The following info chart shows, that a lot of mobile SERPs have a News Box in the USA, France and UK. This applies less Germany, but it still concerns more than half of the SERPS. 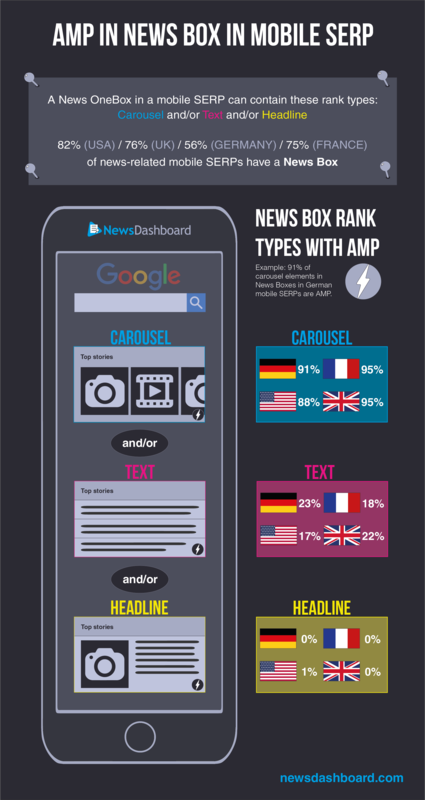 We only took news-relevant keywords into consideration for the analysis, and came to the following results (Example USA): 88% of the carousel articles in the mobile SERP of the Google News Boxes are AMP articles, 17% of the text elements are AMP, and 1% of the headlines are AMP. It is remarkable that up to now cross border the text elements are cleary below 30% AMP yet. But the figures for this News OneBox element are strongly rising in the last weeks, whereas for the other two elements the changes have been small. In general, the data show that cross-border, the majority of carousel articles are AMP. Usually, either all articles of a carousel are AMP, or none. We did not detect this development yet for text and headline elements. Considering Google’s announcements that AMP in the mobile SERP will gain continuously more importance, we will keep an eye on the development and analyse it continously with focus on the news elements but not only.